These fun and unique scripted custom Hen-Do Printed Lollipop Favours are a perfect addition to any fun-filled pre-wedding celebration. Add sparkle for that extra special touch. 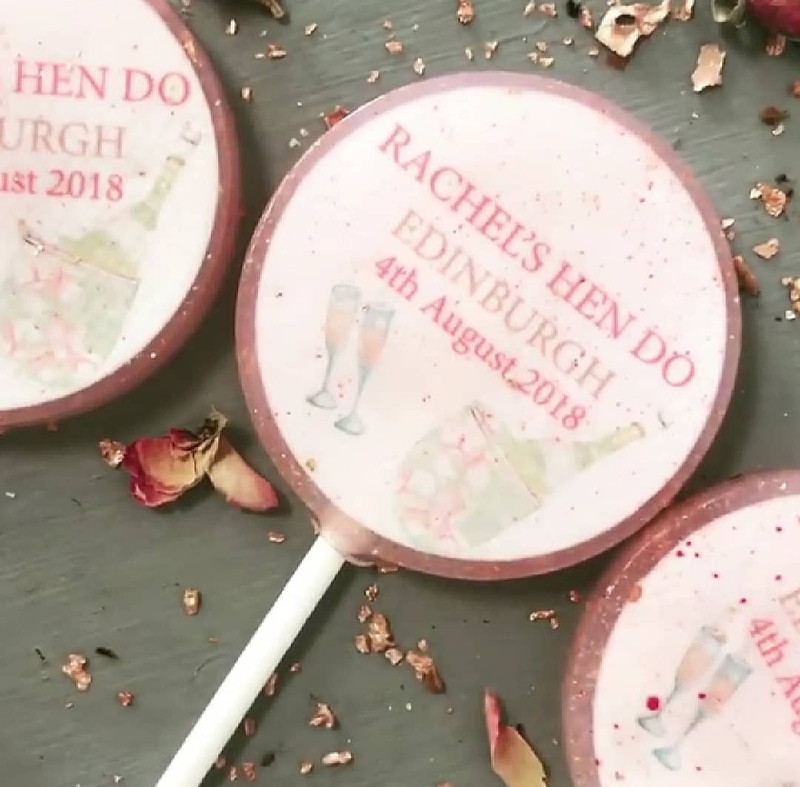 The Hen-Do Printed Lollipop Favours come wrapped in individual clear cellophane bags. Small, blank, stamped or custom card tags are available to purchase. SMALL: 1.5 inch round lollipops. LARGE: 2 inch round lollipops. Our lollipops can be made in large quantities to meet your requirements. Please get in touch via the contact page for a personalized quotation. Please contact me via the contacts page with any important details regarding delivery. Available in a wide variety of colours and flavours including vanilla, cotton candy, marshmallow, coffee, watermelon, rose and champagne feel free to get in touch for a specific colour or flavour not listed in the option menu. To ensure freshness, Christmas orders will be shipped out on the 19th of December unless otherwise requested by the customer. Made from natural sugars (cane sugar, glucose), colourings (approved colourings, acetic acid, glucose, water) and flavours (approved flavouring substances, water and propylene glycol, some may contain alcohol). Edible sparkles contain Wheat Starch, Fructose, Glucose, Thickener E440, Approved colouring, Vanilla Essence, Preservative E202..Wrapped in a plastic pouch, presented on a paper stick.